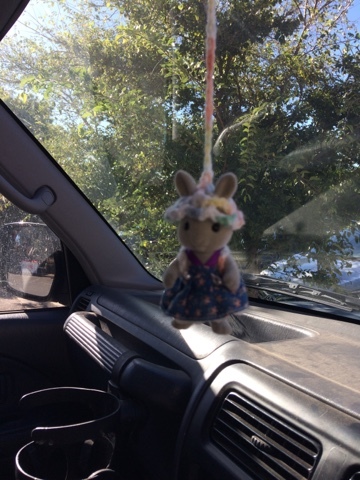 This week I had a thought; Would any of my Sylvanians like to keep me company when I travel alone in the car? So I asked them. Most politely said no, they were content to stay safe in the village. But one young bunny excitedly told me she would love to come explore to big world. So I introduce to you Opal Babblebrook, youngest (& most adventurous) child of Cliff & Pearl. She is quite the character! Thank you Emily. :) thank you, she has already kept me company on quite a few errands this week! A new family & a surprise.